I'm going to make this short since that summary above is so long. I loved it. 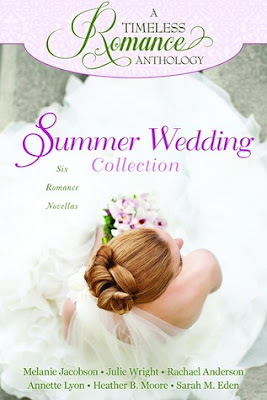 The first and last novellas by Melanie Jacobson and Sarah Eden are clearly the best. Which is why I'm guessing they are placed that way. I love how clean these little romances are; yet they aren't based on an LDS relationship. They are just good and clean. I've been so busy this summer that reading hasn't been making itself a priority yet these little novellas are perfect! I can read one during my son's nap or while we're outside playing. I read one before I go to bed too. They are just enough to wet my appetite. Melanie Jacobson is on my auto buy list. I will read anything she writes. I've never read Sarah M Eden but because of her novella I'm so going to read her books. I'm not familiar with a few of the other author's here and I'm intrigued about their books as well. I love that a novella can just wet my appetite and get me to try a new author with no risk. Now, I know I want to invest more of my time into a bigger book of theirs. I loved it so much I grabbed the Spring Vacation Collection immediately after I finished this!